Internet of Things (IoT) is one of the most disruptive IT technologies that exist today. It can be classified as a phenomenon in which devices equipped with sensors, actuators and processors communicate with each other to serve a meaningful purpose. It is also defined as an interaction between the physical and digital planes; this interaction takes place with the help of various sensors attached to all conceivable objects. IoT has the power to change the way we interact with our belongings and in an industry or enterprise, it can change the way the businesses runs. Energy companies across the world are already using IoT to optimize usage. Sensors are attached to electrical units to measure consumption and patterns, and accordingly switch on or switch off when required. IoT sensors are also being used for traffic management, water management and various other Smart City components because of the technology’s ability to be remotely manageable. Sensors + Actuators: The first layer is the physical layer that comprises of sensors that sense and collect data about the environment. Its work includes to pick up physical parameters or identify other smart objects. Then come the Actuators that can affect a change in the environment. For example, a sensor will sense that the temperatures have changed the light is low and thus it is dusk, while an actuator will then automatically switch on the street lights. Then comes the Internet Gateway Layer. The data that comes from the sensors needs to be prepped up before it enters the eventual processing stage. Basically, the data that is received in analog form needs to be aggregated and converted to digital form and this layer does exactly that with the help of an Internet gateway which routes it over WLANs or such other networks for further processing. Both the above layers are situated quite closely with each other so that collection pre-processing can be done in real time. These gateways can build to be intelligent with additional functionalities like analytics, protection against malware and data management. The pre-processed data then enters edge computing IT systems performs further analysis of the data. While the above two layers will be located at actual site of the device, an edge IT processing system will be situated in remote offices or other edge locations but not as far as the DC. Usually the IoT data is so enormous that if directly sent to the data center or server it can eat up crazy amounts of network bandwidth swamping your resources. Thus, systems at the edge perform analytics to lessen the burden on core IT infrastructure. The last stage is where data is analyzed, managed, and stored on strong IT systems. This data is the one that needs more processing, and the feedback need not be immediate. A data center or a cloud-based system suits this purpose perfectly. Here, the results take some time come but what is available is more in-depth and can be combined with other data for deeper insights. The first two parts of the architecture or the first two stages are all about Operations Technology (OT) while the next two are about Information Technology (IT). While the two are not mutually exclusive, the lines are definitely blurring. 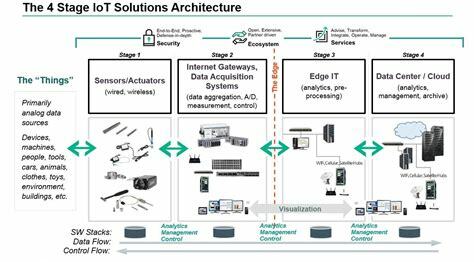 A higher level of collaboration is required between the two now as the functions start to converge to execute more value for IoT via data processing and domain expertise. The perception layer, which essentially the physical layer of sensors. The transport or network layer which connects the ‘smart things’ to network devices and servers or basically transfers the sensor data from perception to processing layer through networks. The processing layer stores, analyzes, and processes the humongous data and employs various technologies like big data, etc. The application layer which delivers application-specific services to the user. Besides, a Cloud-based systems architecture, once can also deploy a Fog-Based architecture. In the former data processing is done in a large centralized fashion by cloud computers where cloud is at the center of the system with applications above and the network of smart things below it. This type of a system provides excellent flexibility and scalability and services like core infrastructure, platform, software and storage. In fog computing, the architecture comprises of monitoring, preprocessing, storage, and security layers between the physical and transport layers.